This LibGuide was specifically designed to be used during the Multicultural Student Bridge Program. It focuses specifically on the history of diversity at Lebanon Valley College from its inception in 1866 through the early 1900's with some exceptions. 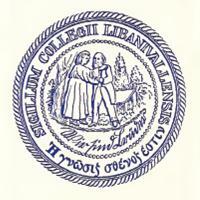 The first seal of the college. Lebanon Valley College; A Centennial History by Wallace, Paul A. W.
Centennial history of the college. Lebanon Valley College yearbook, previously titled The Bizarre. This LibGuide was specifically designed to be used during the Multicultural Student Bridge Program. It focuses specifically on the history of diversity at Lebanon Valley College from it's inception in 1866 through the early 1900's. There are a few additions and connections to the current day. Thanks to the class of 2015, their multicultural mentors and to Venus Ricks, Director of Multicultural Affairs for sharing enthusiasm for the legacy of diversity at LVC! The Church of the United Brethern in Christ founded the College in 1866, as a private coeducational institution on the site of the Annville Academy. It became a four-year institution by 1883 as the lower grades were phased out. LVC's current motto was adopted in 1906 - Libertas per Veritatem: "The Truth shall make you Free"
If you walk behind the current library - the Vernon & Doris Bishop Library - you will see that the motto "The Truth Shall Set You Free" is engraved onto the building.